Kids Can Press, 9781771389198, 40pp. Little Panda startles Big Panda awake inside his den. 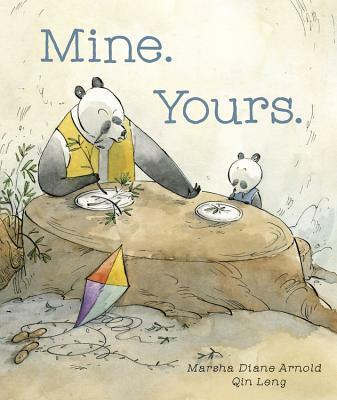 So Big Panda (who's a little cranky) sets him straight by declaring, ?Mine.? Then he puts Little Panda outside on a rock and tells him, ?Yours.? When Little Panda appears at breakfast wanting Big Panda's food, he tells him again, ?Mine.? Though, to encourage Little Panda to leave, he hands him a kite and says, ?Yours.? At first, Little Panda has fun flying the kite. But soon he begins disrupting the other animals in the forest. They all give him the same message: their things, ?Mine;? the kite, ?Yours.? However, Little Panda is unable to stop the wind-blown kite's tail from sweeping up the animals' things. And soon the animals themselves are precariously swinging from it, too, as they try to reclaim their stuff. Can they all learn a new word --- ?Ours? ?